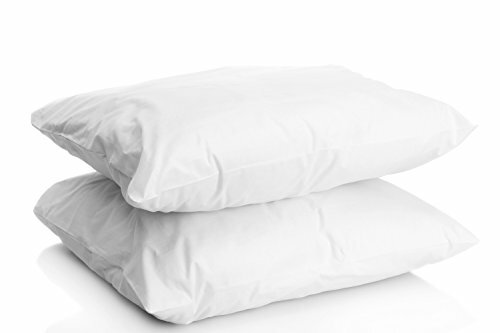 This is one of the most popular down alternative hotel pillows for good reasons. Although they use gel, the pillows are still fluffy for cloud-like head rest. They are also hypoallergenic and dust mite resistant in design. Very nice and beautiful pillows. They are comfortable and soft with strong double stitched edges for durability. The pillow also comes with multiple comfort choices, with soft, medium, and firm options available. 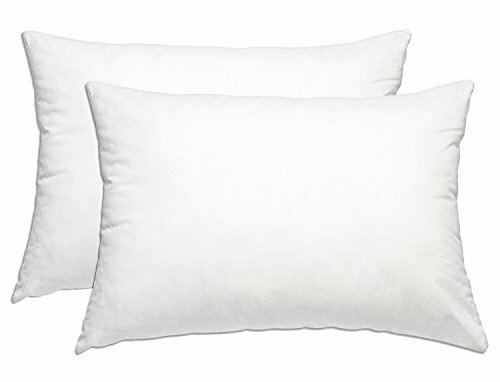 One of the best deals for an affordable down alternative pillow set. The simple design and softness makes for a decent pillow for comfortable sleep. It is also very durable with adequate double stitching along the edges. Very thick and fluffy, soft pillows. They are well made, do not sink to the bottom when your head is on it, and are comparable to down pillows. It also works great for side sleepers because of how thick and filled they are. Well made and consistent in softness. Despite being gel, they are fluffy and allow the head to sink a little into the pillow for hugging support. They are very soft and very puffy pillows. The double stitching construct helps ensure the pillow is durable and long-lasting. The pillow also provide decent loft for back and stomach sleepers. Back and stomach sleepers might not have the best time because of the thickness of the pillows. The pillows do sleep warm, too. Needs to be fluffed up every day as instructed. Does require the occasional fluffing. Side sleepers might not have enough stuffing and loftiness for their sleeping position. Buying the right pillow can become a daunting task because you don’t know where to start. Luckily, down alternative pillows are one of the better material types of pillows available, and for good reason. Down alternatives, also known as synthetic, are hypoallergenic and won’t trigger any feather allergies, they are soft and warm just like down filling, and they are an inexpensive option for a pillow. 1 What Makes a Great Down Alternative Pillow? What Makes a Great Down Alternative Pillow? Down and down alternative alike are known to be soft pillows that are best described as cloud-like experience. 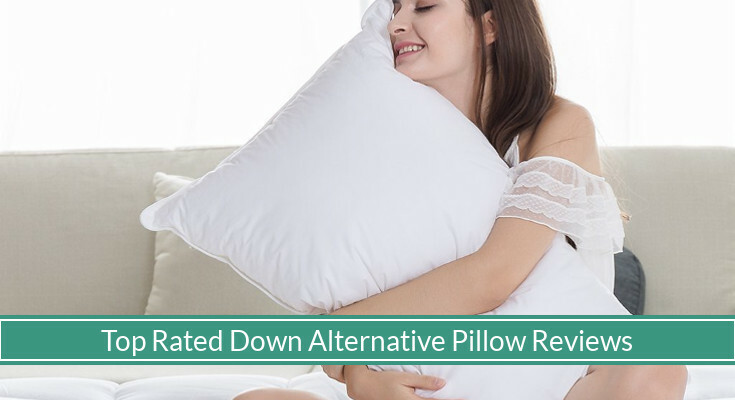 A great down alternative pillow has sufficient filling to provide some amount of loft (albeit down alternative pillows are not known for thickness). The filling will provide the cushion and the cover will provide a somewhat flat surface for your head to rest on top. This one is difficult to measure. However, a down alternative pillow that is thick and of reasonable size will contain more filling ounce. Filling compress extremely well so it may not be the best judgement of a quality pillow. More filling will always better than less for a pillow to comfortably support your neck. This is not to be confused with fill power. Fill power is not a good indication of the amount of filling a pillow offers as polyfiber can compress well. Unlike the popular memory foam material, down alternative does not have a dissuading odor when unpackaged. This initial odor, also known as off-gassing, is the break down of VOCs, or volatile organic compounds. It’s most common in foam and adhesive material, such as from a fresh coat of paint or a brand new car. Down alternative pillows should not have any materials that emit VOCs. 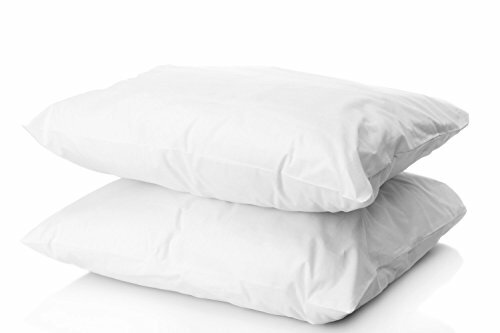 Most shoppers purchasing a down alternative pillow are looking for similar traits of a down pillow, without the feather allergies. If a down alternative pillow uses any actual animal material such as feather, then the pillow may not be hypoallergenic and can trigger allergies. If you want more options, you might be interested in considering all-natural organic mattresses. 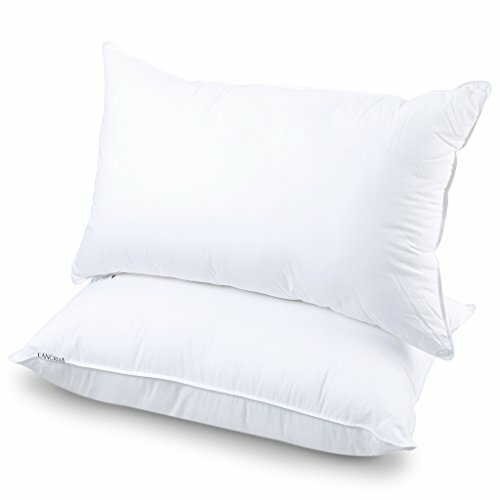 One of the great attributes of a down alternative pillow is its lightweight nature and ease of use for pillow fights. On average, down alternative pillows weigh roughly 2 to 3 pounds unlike memory foam pillows which can weigh up to 5 pounds. The weightlessness of the pillow allow more hits per minute compared to its more popular counterpart, making down alternative pillows suitable for those who value smacking their enemies several time vs. a single power hit. The Beckham Pillow is a for 2018 gel-filled fiber pillow that comes in a pack of two pillows. This pillow is stylish without covers with silver horizontal stripes alternating with white stripes. 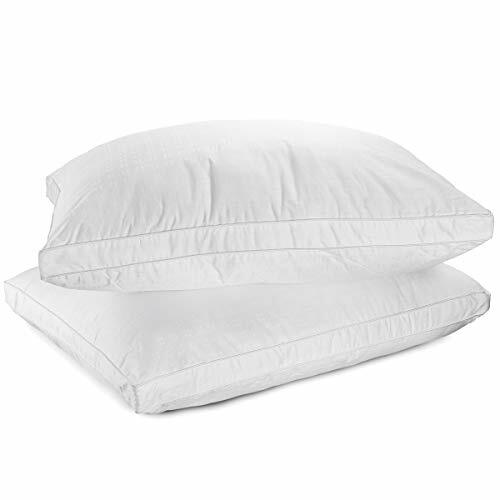 The pillow use 100% cotton cover with 240 in thread count. 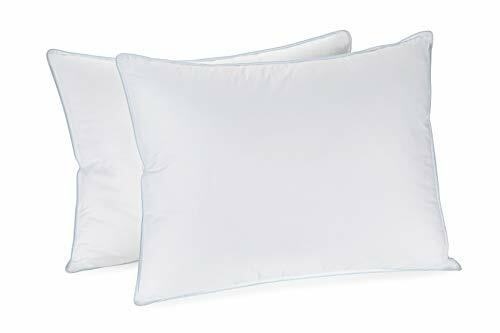 The pillow is relatively short in length that, along with its no-shift construction, prevent filling from unevenly spreading to one side of the pillow. The Beckham Hotel Collection Pillow has high review ratings and shoppers with all sleeping positions have found the pillow to be comfortable. The pillow has no smell, come in an airtight bag, and puffed up right away. 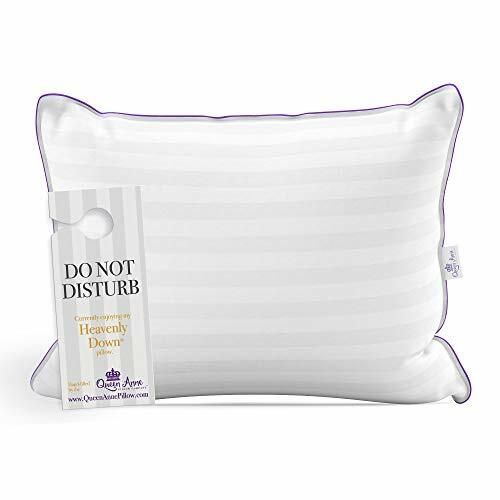 The Queen Anne Heavenly Down Pillow is a hotel pillow that supply the best hotels in the hospitality industry. Hotels such as the Marriott, New York Palace, and Hilton Hotels use this pillow. The stylish purple outline with alternative silver-white stripe is a unique appealing design. The construct of the pillow prevent filling from shifting unevenly inside and provide cushioned supportive head rest for sleep. 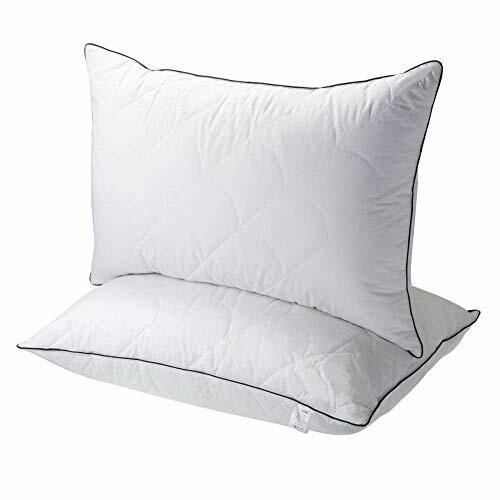 The pillow is filled with faux goose down with polyester clusters for consistent density. The filling is microdenier fiber spun from 100% polyester. Microdenier, compared to standard denier fabric, provide a sheer, soft, and silky fiber filling. Using microdenier fiber means the Queen Anne Heavenly Down Pillow provide a soft and high quality cloud-like pillow experience. The pillow is available in a wide selection of firmness and sizes. It is made in the USA. 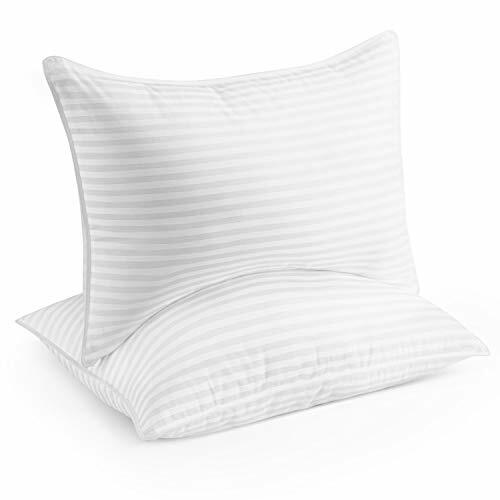 The Langria Pillow is a pillow with polyester fiberfill and 100% cotton cover. The pillow has 28 ounces of filling, slightly above average relative to other pillows, and has a thread count cover of 233. The pillow is highly regarded by reviewers and for good reason: it is engineered to prevent filling shifting unevenly, feels luxurious, and hypoallergenic. The pillow use a double stitching construct for extra durability along the edges. The pillow is odor-free and is vacuum sealed in packages for delivery. The pillow is very soft and cloud-like head rest experience. They do a decent job offering relieve pressure along the neck and spine, without being too high to curve the spine uncomfortably. The SmartHome Bedding Pillow is a polyester fiber filling pillow with a 50-50 cotton and polyester cover. The 50% polyester, unusual for a down alternative pillow, provide more durability in the stitching of the pillow. Although it doesn’t guarantee that it can survive a pet tearing or clawing the pillow, polyester provide a longer lifespan for the pillow. The pillow is filled with 25 ounce of microfiber, which is slightly above average for a down alternative pillow. The pillow is not as fluffy as our other recommended pillows, but it is highly durable and is similar to the ones used by hotels. The pillows are machine washable and dryer friendly (on low). The SmartHome Bedding Pillow is made in the USA. The Mastertex Pillow is a 100% microfiber filled pillow with many available sizes. What makes the Mastertex Pillow unique is the gusset design of the pillow. The 1.5-inch gusset is an extra piece of material that helps expand and give structure to the pillow. It is the little side panel along the edges of the pillow that gives the filling more space to move around for a consistent comfort. The Mastertex also comes with a grid-like window pane jacquard pattern cover that is 100% cotton and has a thread count of 300. The pillow is shipped in a clear plastic carrying case for travel and storage, and comes with a 1 year warranty. It is machine washable and dryer friendly. There are a range of down alternative pillows available to consumers. The pillows are soft, cuddly, and hypoallergenic. Being fluffy and lightweight, the pillows can provide a good night’s rest with loft that can avoid straining your neck and slouching your spine. One recent addition to down alternative pillows is the addition of gel filling to provide a cooler sleep surface for those who sleep hot at night. Down alternative pillows mold easily as you need and can support a wide variety of sleepers in need of a pillow with less loft. We hope you found this handy pillow guide useful and the research we have done for you to help you find the right pillow for you.